Raspberries are a popular summer treat, and growing them in your home garden can be a rewarding experience. Dozens of raspberry species are grown throughout the Northern Hemisphere, and most climates in the United States are suitable to raspberry growth. Raspberry plants grow their fruit on canes. Each plant contains primocanes--first-year canes that produce no fruit--and floricanes--the second-year canes on which the berries grow. If you want to grow raspberry bushes, it's best to have an understanding about what will be required. 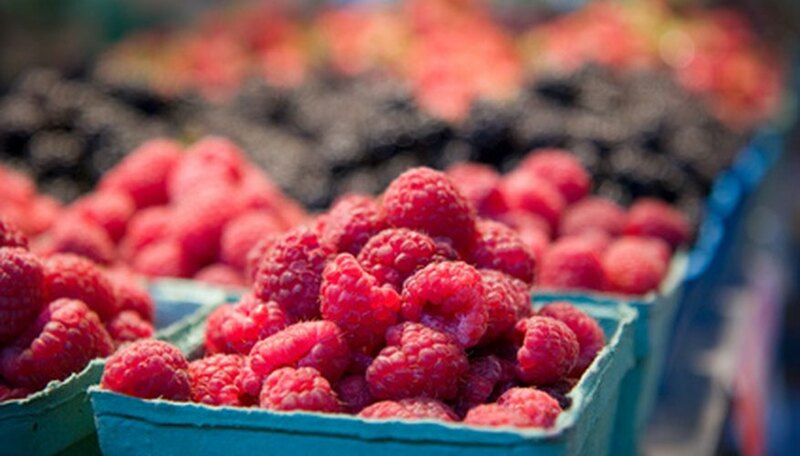 Raspberries grow well in climates with mild winters and moderate summers. Extreme heat or cold can damage the plants and they may not grow as well as they should, but they can be grown successfully throughout much of the United States. Windy weather can also stunt the growth of the fruit-bearing canes. Raspberries should be grown in full sun. It's best if the plants get six to eight hours of sun a day, but they can be grown in partial shade. One of the keys to growing raspberries is to plant the bushes in a well-draining soil. If your soil does not drain well, it's best to plant the bushes in raised beds. Raspberries also do poorly in heavy, clay soils. Optimal soil pH for raspberries is between 5.8 and 6.5. Raspberries should not be planted in soil where tomatoes, peppers, eggplant, potatoes, strawberries and other cane-fruit berries have been grown in the past three years to prevent against disease. Raspberry plants should be planted in the ground at the same depth they were grown in the nursery. When placed in the hole, allow the roots to spread out naturally. If you are planting multiple bushes, space them 2 feet to 3 feet apart with 6 feet to 8 feet between rows. Give the plants a thorough watering immediately after planting. Depending on the variety you are growing, you may need to install a trellis system for support. Raspberry plants do require some care and maintenance to keep them growing and thriving. Each spring, fertilize the plants with a 10-10-10 fertilizer. Time the fertilizer application for when the new growth begins. Once your plants are established, you can mulch around them to help the plants retain moisture and prevent weeds. It's also important to keep the area around the plants free of weeds. Pruning is also important with raspberries. For summer-bearing plants, they should be pruned at the beginning of the growing season and at the end of the harvest. After harvest, remove all the fruit-bearing canes--called floricanes--from the plant. Raspberries producing fall berries should have their canes pruned back to ground level once they are dormant. Once the fruit begins to ripen, they should be picked every three to four days. Ripe berries will be a deep reddish purple in color. Pick the berries by plucking them off the cane, taking care not to twist or damage the wood stem. To extend their shelf life, pick the berries when they are dry and place them in the refrigerator immediately.